Astoundingly comprehensive collection of essential market research tools. ...... .. then fix them! * Build quality links with ease... saving you time & money! * Project Dashboard - Easily see a quick overview of the SEO performance of any of your websites via Traffic Travis's Dashboard. This includes your Alexa traffic rank, the number of pages that you have indexed from your site in Google, Yahoo and Bing; your top 5 pages based on search engine positions on the keywords you are monitoring, the number of backlinks to your site, the top backlinks to your site by PageRank and lots more. * MySite On-Page SEO Advisor - This is just like having a Search Engine Optimization expert sitting next to you to help, without having to pay them $100 an hour or more to give you advice! Qweas is providing links to Traffic Travis 4.0 as a courtesy, and makes no representations regarding Traffic Travis or any other applications or any information related thereto. Any questions, complaints or claims regarding this application Traffic Travis 4.0 must be directed to the appropriate software vendor. 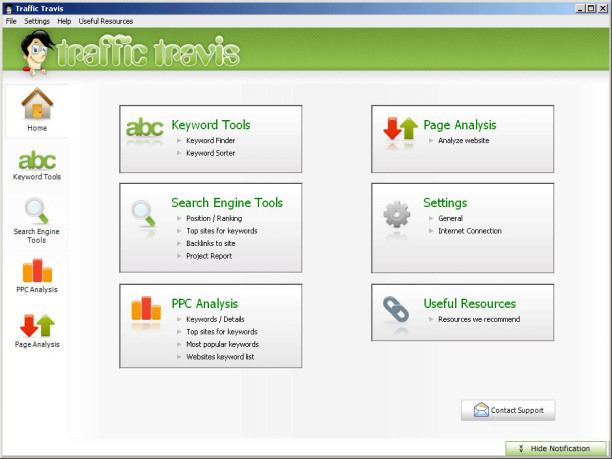 You may click the publisher link of Traffic Travis on the top of this page to get more details about the vendor.